Vitamin B12 is required for healthy nerve fibers and to prevent the accumulation of homocysteine in the blood. It plays an important role in energy production, immune and central nervous system function, and in Folic Acid metabolism. 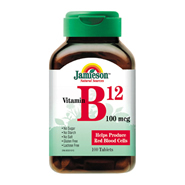 Each tablet contains: Vitamin B12(Cyanocobalamin) 100mcg.